Anyone who is used to eating mass-produced industrial bread who has tasted bread made at home in a bread maker can quite understand why bread makers are so popular in so many homes. They can make absolutely delicious bread. Added to that, home bread makers can make a wide range of different types of bread, make dough and in many cases make jams and chutneys. Well-made home produced bread has always tasted better but to make bread at home by hand is very time consuming and does require some skill. The Breadman TR520 is a very good example of what a modern bread maker can do and the ease in which it can do it. Not only can the Breadman TR520 (see today's price) make a standard white loaf by just adding the flour, water and yeast at the press of a button, it can also make a whole range of breads as well as making whole wheat, sweet, French and batter breads. With most of these breads there is a rapid option to make a loaf much quicker than normal. You can also select the darkness of the crust that your chosen bread has, either light, medium or a dark crust. The Breadman TR520 will make bread in 3 standard sized loafs, a 1 lb. small loaf, a 1 ½ lb. medium loaf or a 2 lb. large loaf. Then there is the option to just make the dough for shaping by hand or even making a variety of jams. If, for example, you want to wake up to freshly baked bread, the Breadman TR520 had a start delay feature which allows the start of the bread making to be delayed for up to 13 hours. If the bread is not removed when the baking cycle is finished it will automatically switch over to the keep warm setting for 60 minutes (or until you press stop). Breadman may not be a readily familiar name in the field of kitchen appliances or otherwise to many people. Breadman though is part of the same company that makes Russell Hobbs appliances as well as the George Forman Grill among other brands. The Breadman TR520 measures 13 ½ inches x 12 ¼ inches x 13 ½ inches and weighs 10 lbs. Externally it is made of white stay cool plastic, one of the few bread makers that do not get too hot to the touch while baking the bread. The light yellow control panel is located on the top at the front, but this light yellow background and white writing which is in quite a small font this can make it difficult to see for some people. However, all the selections chosen are shown on the LCD panel which makes the selected program and settings much clearer to see. As with every other bread maker when adding ingredients to make your bread it is important that the liquid is added first (plus any salt that is going to be used), then the flour and finally the yeast. By adding the ingredients in this order the yeast will not be activated prematurely. This is especially important when the Breadman TR520 is used on the delayed start cycle. One of the major reasons for a poor result with the finished loaf is the yeast not being activated at the correct time and the loaf not rising as it should as a result. A second major reason is the incorrect quantities of ingredients. Following the recipes in the Breadman TR520’s included recipes can be part of the problem as the measures for flour is given in cups. Depending on how compacted the flour is in the cup will affect the actual quantity of flour used and as a result the quality of the finished loaf. Regrettably this is common through most bread makers. It would be well worth investing in a bread baking cook book that gives items like flour etc. in weights. That being said, when you have sorted the ingredient quantities make the loaf is the easy part. Just select the setting that you want for your loaf (or dough), select the size of loaf to suit the quantities of ingredients, choose how light or dark you want your crust and press start. Then it is just a matter of waiting until the bread is baked and ready to eat. When you want to use the delay start feature the only difference compared to baking a standard loaf is after the ingredients and bread selection is made press the timer button. The 13 hour timer countdown to when the bread is finished. So if you want your bread ready at 6.00 pm and you are preparing it at 8.00 am you need to set the timer for 10 hours. When you want to add fruit or nuts to your loaf the Breadman TR520 will pause and bleep after the kneading to allow you to add them. This will only happen on standard style loaves and not on the rapid bake or batter bread settings. The Breadman TR520 is a very versatile, but at the same time quite easy and instinctive to use bread maker. Whereas with some kitchen appliances that do many things and have a multitude of functions, the instruction and controls need to be constantly referenced in the user manual, with the Breadman TR520 the controls are very user friendly. The only small point that lets it down is the light yellow background with small white printing on it telling you the settings. This however, is only a small point as the selections scroll through the easy to read LCD display window. This minor issue is more than made up for with features and capabilities that it does have. Like being able to make small, medium or large loaves, with a choice of the shade of the crust. Being able to make pasta dough as well as normal bread dough, to name just a few. Bread makers do get hot as they bake the bread and the fact that the Breadman TR520 has a stay cool outside is very handy. The Breadman TR520 is very popular with its users. 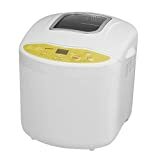 It is one of the top selling bread makers on Amazon.